For women coming out of abusive relationships, prostitution, or the chaos of substance abuse, the order, security, and beauty of this house can be a balm. 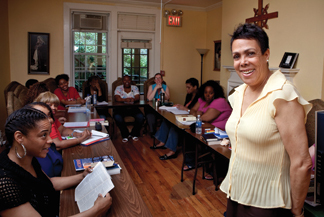 Women’s Program Director Debbie Jonnes says, “We provide a safe and secure environment where someone can come to know the love of Christ.” For many women it’s the first place that has afforded them the security and stability to take stock of their lives and deal with the personal issues that have so often driven them to addictions and unhealthy relationships. Visit the Bowery Women’s Center website. Bowery Mission Women’s Center from james Allen Walker on Vimeo.